The 2018 Pelikan Hubs event has been anticipated by fans across the globe ever since last year’s highly successful gathering. With just a little over three months to go, Pelikan has officially opened up registration. This year hits a milestone as it marks the fifth anniversary of this pen and ink centric happening. The Hubs event has shown consistent growth over the past four years with 2017 coming in as the biggest year to date, a record that’s very likely to be bested once again. You may recall that there were 145 individual Hub locations spread across 43 countries with 3600 registered participants last year. That represents roughly a 38% increase over the attendance for 2016. If you are reading about this for the first time and wondering what the heck a Pelikan Hub event is, let me enlighten you. The Pelikan Hubs is a fan driven gathering of Pelikan aficionados from across the globe who meet on the same local date and time. With no specified agenda, anything goes meaning no two hubs are quite alike. Throughout all of this, Pelikan acts in a supporting role, providing the necessary organization and a few supplies, allowing the hub master and their attendees to free form an evening of festivities. For those who cannot attend, the various locations can be followed on social media via the hashtag #pelikanhubs. My local Philadelphia hub has always been a good time, attended by a growing and diverse group of fans. You can read about my past adventures here (2017), here (2016), and here (2015). One thing for certain is that there is usually no shortage of Pelikan eye candy. With a minimum of five people required to constitute a Hub, locations get selected based on a registered pool of online applicants. During the sign up process, you can nominate your city for inclusion if it is not already listed. Hub locations will be finalized sometime around July 9th. Once the participating cities are chosen, a Hub master is selected, by special application, to act as your local point of contact and organizer. It is the Hub master who designates a centrally located meeting place and distributes some Pelikan swag to all of the registered guest in attendance. Read on for all of the details for this years Hub. Pelikan Hubs 2018 will take place on Friday, September 21, 2018 at 6:30pm local time. Online applications are now being accepted through July 16th, roughly adhering to the same time frame as last year. I strongly encourage anyone with even a remote interest to sign up. This serves to ensure that you do not miss out on the deadline and it helps your city reach the critical mass required to qualify for a Hub. There is no penalty should you later not be able to show up. What can be challenging is trying to get into a Hub after the registration has closed since this is up to the Hub master’s discretion. It can be difficult, depending on the venue, to later make space which can contribute to a lot of unnecessary stress for the event planners. Also, failing to register means that you will not qualify for any of Pelikan’s swag should you be able to attend. In the past, that swag has included pen holders, cases, note pads, and ink. If you think that you’d like to be the Hub’s master for your location, there is a separate space with a fill-in box on the application but you must get your name in before July 9th to be in the running. Once your registration is submitted, Pelikan will send you an e-mail confirming your details. Let me also tell you that this pen bash is not just limited to Pelikan. One of the neat things is the diversity of pens that people bring and while it skews heavily towards Pelikan, I’ve personally seen a lot of variety. I’ve even spent the evening with people who have yet to buy their first Pelikan and who just wanted to see what it was all about while also learning a bit about the brand. This event is for all lovers of stationary, ink, and fine writing instruments. Available on Pelikan’s website, and I’ll include it here for your reference, is a list of may of the pre-determined cities, most likely based on attendance from years prior. 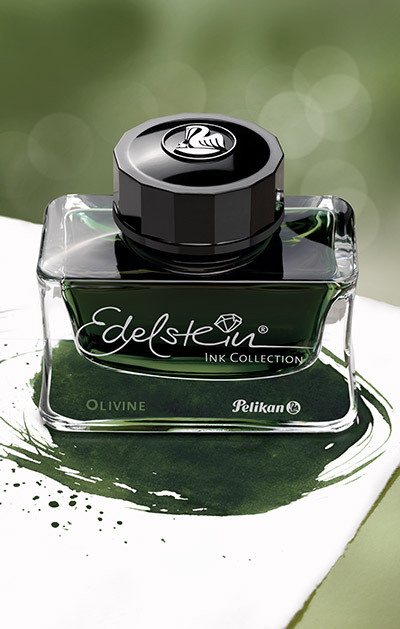 Finally, not breaking with tradition, the color scheme for this year’s event matches the Edelstein Olivine 2018 Ink of the Year which is expected to play a prominent role in the event. United States: Atlanta (GA), Austin (TX), Baltimore (MD), Boston (MA), Boulder (CO), Buffalo (NY), Charlotte (NC), Chicago (IL), Cincinnati (OH), Dallas (TX), Dayton (OH), Denver (CO), Des Moines (IA), Detroit (MI), Fort Lauderdale (FL), Fresno (CA), Honolulu (HI), Houston (TX), Indianapolis (IN), Lincoln (NE), Los Angeles (CA), Minneapolis (MN), Nashville (TN), New Orleans (LA), New York City (NY), Orlando (FL), Palo Alto (CA), Philadelphia (PA), Pittsburgh (PA), Portland (OR), Raleigh (NC), Rochester (NY), Salt Lake City (UT), San Antonio (TX), San Diego (CA), San Francisco (CA), San Jose (CA), Seattle (WA), St Louis (MO), Tucson (AZ), Tuscaloosa (AL), Washington D.C.
Rotten luck. Sorry about that. Question for you! I nominated my city and myself for hubmaster. I wrote that i have put together a group in my city of 12 and growing. My group asked how to register and I asked them to wait since our city cannot be chosen. After reading your post it sounds like they need to also nominate our city is that correct? Absolutely! All 12 people should register now and write in the name of the city. When Pelikan sees that there is a decent amount of interest in that city, they may add it to the list so get everybody registered up now. Pingback: PELIKAN HUB 2018 « What's up at Ravens March. 🙂 I’ve already registered for the event. I’m a glutton for punishment. If chosen as hub master this year, it will be my last tenure. Just getting way too stressful. Awesome to hear that you can attend this year’s event. The 5th anniversary should be a good one for your first and I’m sure you’ll enjoy. Thanks for sharing the link Fred. Look forward to seeing you at the Hub event. Should be a good time. Hi! I’m the Hub Master for Cleveland, OH, and wondering if you might have any suggestions for a successful Hub? We’ll have a group of 17 or so. I’m quite excited! Congrats on being named Hub Master. I have a few ideas. I’ll try to send them over in an email sometime over the weekend. As we all are I think, very eagerly.